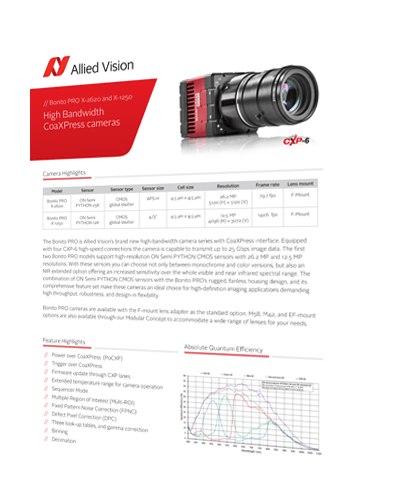 About Allied Vision: Founded in 1989, Allied Vision designs, produces and sells cameras and components for image processing in industrial and life science applications. Allied Vision is at your side throughout the life cycle of your image-processing project. Our specialists provide expert advice, engineering, manufacturing and support for digital cameras, their peripherals and their integration into your machine vision system. Please enter your details below to download the full Bonito PRO camera specifications including feature highlights, absolute quantum efficiency, and mechanical drawings. Bonito PRO is a brand new high speed / high-bandwidth camera series with CoaXPress interface capable to transmit 25 Gbps image data. 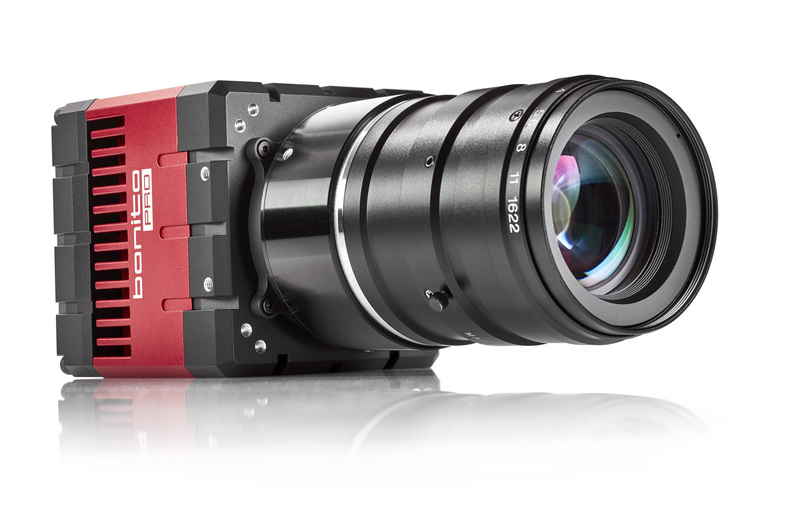 With two models supporting high-resolution 26.2 MP and 12.5 MP ON Semi PYTHON CMOS sensors, a rugged fanless housing design, and comprehensive feature set, these cameras are an ideal choice for all demanding inspection applications that require high-definition imaging, high throughput, robustness, and design-in flexibility. For example PCBA inspection, flat panel inspection, syringe inspection, semiconductor inspection, and 2D/3D surface inspection.